Life Happens Next picks up immediately where the events of Stuck In Neutral leave off. I wish I could link to my review of Stuck In Neutral but I must have read it pre-blog. I did review the companion novel Cruise Control, which tells the events of Stuck In Neutral from brother Paul's point of view instead of Shawn's. Stuck in Neutral was a powerful heartbreaking story of a boy thought to be a vegetable who in reality just has no control over any of his muscles. Having no control means he cannot send messages with his eyes by blinking or speak through a computer or have any meaningful contact with anyone. No one knows that inside his head he is thoughtful and intelligent and for the most part, happy. His father hates the idea of him suffering--not knowing that's he not--and plans to end it. At the end of Stuck In Neutral, we're not sure if his father has gone through with his plan or if he has a change of heart. WARNING: READING THIS REVIEW WILL ANSWER THAT QUESTION. IF YOU HAVEN'T READ STUCK IN NEUTRAL YET, GO DO THAT AND THEN COME BACK HERE. 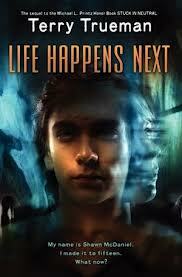 Life Happens Next is definitely a sequel and provides the closure that Cruise Control did not. Shawn has made it to his 15th birthday. While there is no miraculous recovery, he is able to make a connection with an older cousin with Down Syndrome who moves in with Shawn's family after her own parents die. He also connects with her dog who is somehow able to sense his feelings. He still dreams of being able to communicate and run and be free of his restrictive body and being able to connect with Debbie on a deeper level gives him hope for the future. This novel was not quite as powerful as Stuck in Neutral. At times there was a bit too much telling and not showing, but it is hard to write a novel when the main character cannot interact with other characters in any meaningful way. While it's not as ground-breaking, fans of Stuck in Neutral will be happy to finally have a conclusion to Shawn's story. I didn't even know this novel existed. I'll have to check it out. Thanks! I know! I just happened to see it at the library. I'm kind of out of the loop these days though.